Jackson rehearsing a number of his songs for the show. Audiences will be given a privileged and private look at the singer, dancer, filmmaker, architect, and genius as he creates and perfects his final show. MICHAEL JACKSON’S THIS IS IT was directed by Kenny Ortega (High School Musical, Newsies). It was produced by Randy Phillips, Kenny Ortega and Paul Gongaware, with John McClain and John Branca serving as executive producers. It was distributed by Columbia Pictures in association with The Michael Jackson Company and AEG Live. It has a run time of approximately 111 minutes and has been rated PG for some suggestive choreography and scary images. Sony Pictures Home Entertainment offers music lovers a backstage pass to witness the King of Pop plan and create what would have been his electrifying and triumphant return to the stage when MICHAEL JACKSON’S THIS IS IT debuts on Blu‐ray, Single Disc and Two‐Disc Special Edition DVD on 22nd February 2010. After breaking box office records around the world, MICHAEL JACKSON’S THIS IS IT will dazzle on Blu‐ray and DVD. Directed by Kenny Ortega, the Blu‐ray and DVD releases will allow fans to go beyond the theatrical experience of the film with the two documentaries "Staging The Return: Beyond The Show" and "Staging The Return: The Adventure Begins," in which Michael Jackson is shown developing, creating and rehearsing for his sold‐out “This Is It” tour. Also available are a series of illuminating featurettes, including “The Gloved One,” a costume themed featurette; “Memories of Michael,” in which cast and crew pay moving tribute to the legacy of Michael Jackson; “Auditions: Searching for the World's Best Dancers,” spotlighting the search for the show’s incredibly talented backup dancers; and the film’s Theatrical Trailer. Also included exclusively on the European release is the never‐before seen additional featurette ‘The Unfinished Rehearsals’ in which Kenny Ortega and Production Designer Michael Cotton reveal two showstopping concepts for This Is It which never made it to the big screen. Additional features exclusive to the Blu‐ray include the complete and uncut versions of “Smooth Criminal” and “Thriller,” two all‐new vignettes seen briefly in the film, along with a special “Making‐of Smooth Criminal” featurette. In “Smooth Criminal,” sit back and marvel as Michael Jackson seamlessly shares the screen with some of the greatest movie stars of all‐time in a new black and white vignette that celebrates Michael’s love of ‘Old Hollywood.’ Then, in the all‐new “Thriller” vignette, watch in awe as Michael brings one of his most popular songs to a monstrous second life in a thrilling new video featuring a whole new cast of zombies, ghosts and ghouls igniting awareness with all‐new and signature Jackson dance moves. 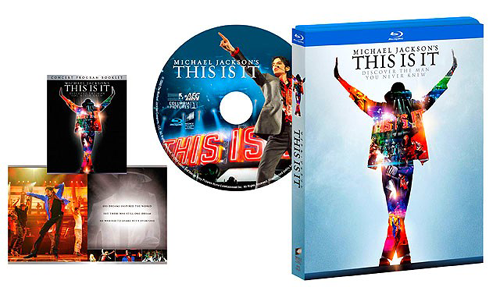 Exclusive to the Blu‐ray edition of MICHAEL JACKSON’S THIS IS IT are even more must‐have bonus features Jackson fans will love, including the BD‐Live™ enabled movieIQ, which lets viewers add their favourite songs from the film to an emailable “This is It” playlist. With movieIQ, viewers can also access live trivia information about the movie’s cast, crew, music and production – all while watching the movie! Also included is a Photo Gallery with 75 insider photos from the rehearsals as well as an additional featurette “Dancing Machine” in which Choreographer Travis Payne discusses collaborating with dancing legend Michael Jackson on the choreography for his This Is It tour. The Blu‐ray release also includes an exclusive 24 page photo booklet which is a unique archive of photographs taken during the final rehearsals. This in‐depth documentary reveals Michael Jackson’s unique, groundbreaking vision for his ambitious return to the stage, with director Kenny Ortega and the entire crew from This Is It. Director Kenny Ortega and the crew of This Is It discuss Michael Jackson's final rehearsals, and the purpose behind creating the concert film. Costume Designer Zaldy reveals the elaborate new costumes created for Michael Jackson to wear on the This Is It tour. Kenny Ortega and the crew of This Is It share personal stories about working with Michael Jackson, and how they will remember their friend. A look at the high‐stakes audition process, which began with over 5,000 applicants and ended with the selection of 11 exceptionally talented dancers. Kenny Ortega and Production Designer Michael Cotten reveal two show‐stopping concepts for This Is It which never made it to the big screen. Kenny Ortega and Production Designer Michael Cotton reveal two show‐stopping concepts for This Is It which never made it to the big screen. Meet each of the 11 dancers chosen among thousands to dance with Michael Jackson on his This Is It tour. Go behind the scenes with the band members chosen to perform on the This Is It tour with Michael Jackson. Go behind the scenes with the vocalists selected to sing with Michael Jackson on the This Is It Tour. Choreographer Travis Payne discusses collaborating with dancing legend Michael Jackson on the choreography for his This Is It tour. The full‐length vignette starring Michael Jackson which was to be shown before the performance of “Smooth Criminal” at the This Is It concert. An in‐depth, behind‐the‐scenes look at the groundbreaking production of the new “Smooth Criminal” film created for This Is It. The full‐length vignette which was to be shown during the performance of “Thriller” at the This Is It concert. •BD Exclusive: movieIQ: connects you to access real‐time information on the cast, music, trivia and more while watching the movie! Also includes the "This Is It" interactive playlist where you can bookmark your favorite songs featured in the film and email yourself a customized playlist! I enjoyed the movie and I cried because I miss him and he should be here with us.